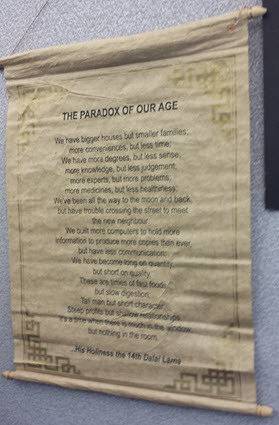 Cubicle décor means a lot to members of cubicle nation. I know this because my group board on Pinterest with exactly that name, Cubicle Nation, is filled with pins depicting ways to upgrade your office space. I also have another board called Cubicle Décor that is filled with more office décor images and tips. This particular tip describes a very simple way to add some personal flair to your home away from home. In my opinion, there is nothing more impersonal than a sterile cubicle with grey walls. If I had to walk into an office surrounded by strictly grey walls every work day, I think I’d go batty! So, what is the obvious solution? Surround yourself with framed pictures of your family, favorite vacation getaways, inspirational quotes, art work from your children, and whatever else that will help personalize your space. I came across a product recently, Lil DaVinci Artwork Display Cabinet Frames, shown in the image on the left, that I certainly wish I had discovered when I had young children. I loved hanging pictures of their latest handiwork that they made in school or at home. I do not own one of these frames but based on these awesome reviews, it looks like they are very well-received. 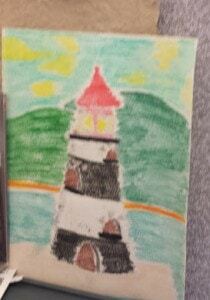 I can certainly see the benefits of having a place to store and display all of the works of art created by your children. It doesn’t even have to be related to your children. It could be that you want to display various pictures that you have taken or perhaps postcards that you have purchased and these frames allow you to consolidate and quickly display any picture of your choice. Getting back to framing my own workspace, I have a number of items on my cubicle walls that have significance in my life. 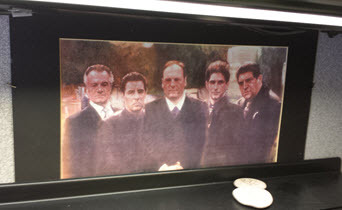 I have a poster from the long-running HBO TV show, the Sopranos, which was one of my all-time favorites. It also reminds me of one of my favorite vacation getaways, New York City, because I purchased this poster in NYC from a sidewalk vendor. This poster is hanging just below my hanging book shelf and just above my desk shelf. If you look closely, it is hung with T-Pins! Hanging this poster with a coat hook clip. 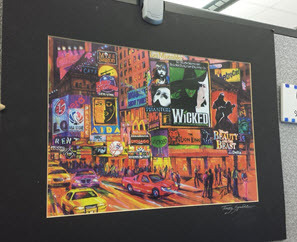 Another poster I have on my cubicle wall is also from New York City and it depicts Times Square (seen above right). We used to vacation to New York City with my children when they were living with us and attended many a Broadway musical such as Wicked, Rent (with the return of Adam Pascal and Anthony Rapp), Mary Poppins, Phantom of the Opera, Les Miserables, and Sweeney Todd. We had many a meal in Times Square before heading over to the theater. What great memories! 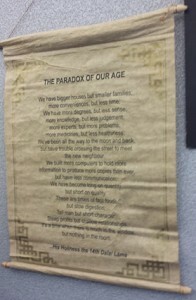 Another hanging poster is called The Paradox of our Age which is a scroll of words spoken by the 14th Dalai Lama. I picked this up on vacation in a store in Martha’s Vineyard which is a quaint island off the coast of Massachusetts. Another picture I have is one of the type mentioned above drawn by my daughter of a lighthouse (seen above). I keep it just above my hanging corner shelf and it reminds me of when the kids used to make some pretty impressive art work for Daddy. I could really have utilized one of those Lil DaVinci Artwork Display Cabinet Frames when the kids were younger.